WHY IS IT SO IMPORTANT TO SOAK YOUR NUTS? soaking your nuts, grains, seeds & legumes is essential for proper absorption and optimal digestion. By soaking your nuts you are breaking down the phytic acid so it can be absorbed properly. Crazy, huh?! 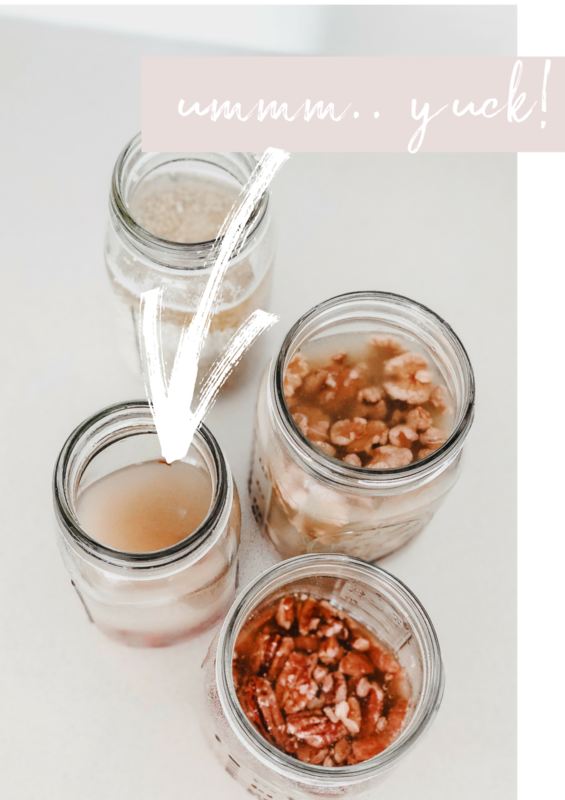 who would of thought that your regular store bought nut isn’t being absorbed as easy or as well as it should be compared to if it had been soaked! Nuts also have high amounts of enzymes inhibitors. This is another reason why un-soaked nuts are hard to digest. Soaked (otherwise known as activated) nuts can neutralise the enzymes allowing for proper digestion. Bloating after eating un-soaked nuts/seeds. HOW DO I SOAK/ACTIVATE NUTS? Soaking your nuts is actually super easy it’s really just about remembering to do it and making the time for it! You’r nuts do need to be soaked overnight for the best result. Measure out 1 cup of raw, unsalted, organic nuts/seeds into a medium sized bowl or mason jar. Cover with 2 cups of filtered water *if you don’t have filtered water you can just used kettle boiled water, it kills the bacteria. Rinse nuts to remove salt residue and spread out in single layer on a rack to dehydrate. Dry in your oven at a low temperature roughly 65°C until dry. If your oven can't be set that low, use a food dehydrator. store your nuts in glass jars like mine and in a cool cupboard for easy access and snacking hehe! Quinoa is a pseudo-grain and low FODMAP food that is rich in protein and fiber. It contains all 9 essential amino acids and is a great gluten free alternative. Quinoa is actually also considered paleo if its properly prepared.. which this recipe teaches! Add 1 cup of quinoa to a glass jar, with 2 cups of warm filtered water, , apple cider vinegar & sea salt. Place a lid on the jar / container and place aside, allow to rest overnight. The next day, pour solution into a large glass bowl, add warm water to the top and stir with a large spoon. You'll see lots of foam. Tilt the bowl left, right, up, and down while pouring and scooping off the foam. Repeat this fill - stir - tilt process till water runs clear and foaming stops. You are removing anti-nutrients and bitterness so don’t slack here. Cover and simmer gently until the quinoa absorbs the fluid, about 12-15 minutes.